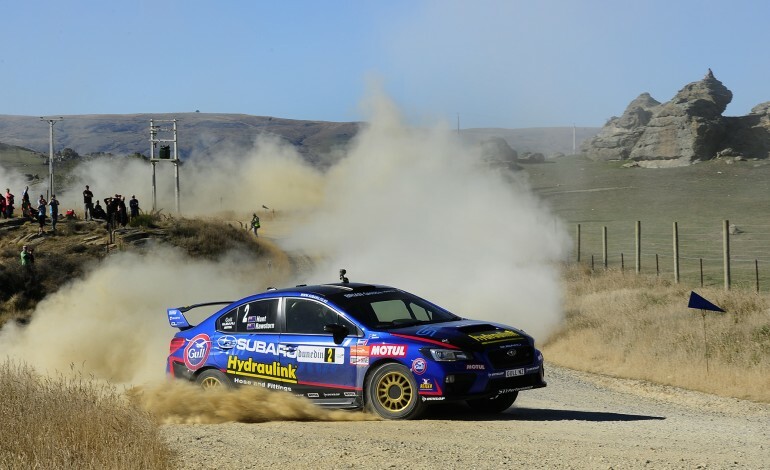 Nelson’s Ben Hunt achieved a highly successful debut result in the two-day, Drivesouth Rally of Otago in his brand new Subaru WRX STi over the weekend. He and co-driver Tony Rawstorn finished second after a see-saw battle with Mt Maunganui Mitsubishi driver David Holder, in this first outing of the five-round Brian Green Property Group New Zealand Rally Championship (NZRC). Although Holder was second after leg one’s eight stages on Saturday, it was Hunt who emerged 18secs ahead at the end of leg two’s nine stages. For the Auckland-based driver, and his navigator Tony Rawstorn, it was the ideal way to begin their national rally championship title defence. “Our goal was to get to the finish and we exceeded that,” Hunt says. After only 50km of testing before the Dunedin-based event, Subaru Brand Ambassador Hunt began the rally on Saturday cautious about how the recently-finished STi would perform under rally pace pressure. He showed his class as a driver and demonstrated the reliability of using a production-based Subaru, by recording three, top three stage times on Saturday and backing that up with a further five, top three times today. “The Subaru WRX STi is an awesome base and as the rally progressed I became increasingly comfortable in it and really felt like I was starting to use the suspension to its fullest ability,” Hunt says. He and Rawstorn gelled well again in the Subaru WRX and as the 17-stage rally wore on, they re-established their title-winning rapport. Trust in each other was vital with some seriously fast, straight sections, where no pace notes were required for more than a kilometre, Rawstorn says. “We were sitting at 180 to 190kmh constantly, then we would corner at 170kmh and get back on the accelerator,” Rawstorn says. Hunt will have a few changes to make before the next NZRC round in Whangarei at the end of the month. These will include lightening the Subaru by removing non-essential parts from the factory-supplied model, such as, the electric windows and replacing the glass with lightweight materials. Otago Rally winner, WRC driver Hayden Paddon will only contest the International Rally of Whangarei and having completed just two NZRC rounds will not be a contender for the overall national title.